When I was finishing up College, I worked at Cutlery World. It was a fun gig, and I learned a lot about knives. I also became enamored with Henckels knives. At the time, the three big lines were Chicago Cutlery, Trident, and Henckels. Chicago Cutlery had wood handles, and stamped blades. I did not care for either, but they were popular. I always liked the forge steel blades of Trident and Henckels. 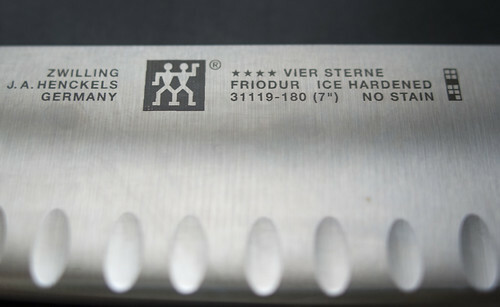 What sold me on the Four Star blades by Henckels was that the handles had no rivets. Rivets are just a place for crud to gather. Flash forward to wedding plans, and I had two things I wanted. A KitchenAid Stand mixer, and a set of Henckels Four-Star knives. They don’t sell quite that set anymore, but it was close to this one: Zwilling J.A. 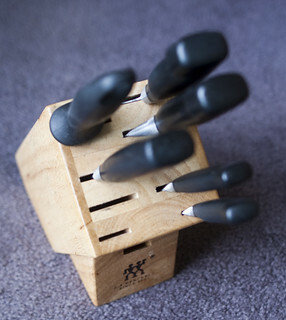 Henckels Twin Four Star 7-Piece Block Set (associate link) minus the Santoku and scissors . This fall I will have been with my Four Star knives for almost 20 years. Oh yeah, and my wife as well. I have since added a 7″ Santoku and 3″ paring knife (it was a mini-set). We have used these a lot over the years, so I can testify to their durability. I like the label; Friodur… Ice Hardened. Getting a set of nice knives, and making them last 20 years does require some care and maintenance. I recently found a series of videos by Bob Kramer (a master bladesmith) created by Sur La Table and JA Henckels. See links after the jump. Here is a nice look at what “sharp” means. You are far more likely to injury yourself with a dull knife than a sharp knife. Here is a run down on how to hone your knife. My personal peeve, the tendency of knife companies calling their honing steel a sharpening steel. Honing and sharpening are different, and both are important. Finally, here he is showing you how to sharpen your blade with a stone, and quick description of the two-step process. Frankly, I keep my blades well-honed, and when they need to be sharpened, take them to professionals. Just don’t want to mess up my investment. Be sure to click through to the Sur La Table YouTube channel. A lot of good stuff there. Also, Bob Kramer has a web site for his business Kramer Knives. To whom do you take your knives for professional sharpening in Cincinnati? I have a set of Shuns that are in dire need of some love; I’d love to find a local business to take mine to rather than using some mail-order place online. I have always used Sur La Table and been very pleased. If anyone else has recommendations, I will pass them on. I would bet Cooks’ Wares would do it as well. “Cincy Sharp” is a local knife sharpening Company that does Japanese waterstone sharpening.